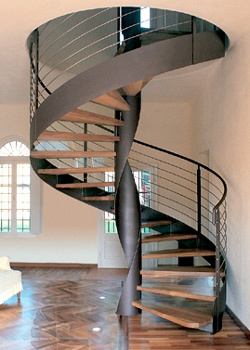 Contemporary stairs are a very important part of our range so how do we define contemporary? It is normally defined by shape and materials, a style described as clean, sleek, chic and high tech. Contemporary stairs use smooth textured flowing materials like glass, chrome, stainless steel, hardwoods in moderation but with interesting textures and finishes. Contemporary stairs frequently use a minimal feel to give a clean light appearance. This effect is particularly strong with the extensive use of glass to allow both natural well designed mood lighting to show through. Stairs & More design and sell not just some of Europe’s most beautiful contemporary stairs we also design and sell lighting schemes and products to maximise the drama and beauty of your new staircase , with careful thought mood lighting can supply many solutions—calm, harmonious or dramatic together with practicality and safety. 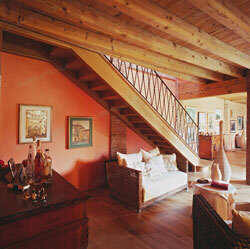 Classical stairs from Stairs & More are a combination of the finest traditions of both Britain and Europe. What they both have in common is the attention to detail, traditional craftsmanship and the highest quality materials. Classical stairs are much more than functional - they are a work of art with the warmth and rich tones of hard-wood predominating. Like a piece of fine furniture, they will be a thing of beauty for generations to come, creating elegance and a feeling of well-being into todays world. As well as designing and producing traditional designs, many of our stairs are modern day classics with a certain flair rarely seen. Stairs & More work closely with our customers to interpret their needs and aspirations, so we can help and advise them to choose the best staircase for their home, but we do not stop there. In our experience, lighting is of vital importance, in making the most of your new staircase, and indeed your home. We can design, advise, supply and arrange installation of any lighting system, including some rarely seen in the domestic marker.